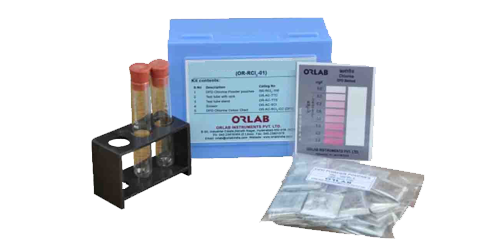 Arsenic Test Kit - Orlab Instruments Pvt. Ltd.
Inorganic Arsenic compounds in the water sample are converted to Arsine (AsH2) gas by the reaction of Zinc Dust and Tartaric Acid. Ferrous and Nickel salts have been added to accelerate this reaction. The Arsine converts the Mercuric Bromide on the test strip to mixed Mercury halogens (such as AsH2 HgBr) that appear with a color change from white to yellow or brown. (Lead acetate cotton ball is used to remove the Hydrogen sulfide (H2S) interference). 150 g Arsenic reagent 1, 24 g Arsenic reagent-2, 47 g Arsenic reagent-3, Bottle of 100 Arsenic test strips, pink spoon, red spoon, white spoon, reaction bottle with red mixing cap, white turret cap, measuring cylinder, arsenic color chart, waste cover,cleaning brush, MSDS sheet, instruction manual in a small Z box.